Life stories are a combination of many different journeys and snapshots in time. Each of these mini stories can be vastly different or in some way connected to one another; however in the end they make up one’s entire ‘life story’. You don’t have to wait for your life story to be complete to share it and hope it might make a difference in some way. Actually by the time your life story is complete you will likely no longer be breathing (I mean not to be morbid, but let’s be honest). Some of your experience might mean nothing to most, yet leave an enormous impact on just one person. So why not share your journey, stories, etc…? You could end up inspiring and changing someone’s life. 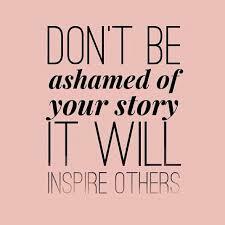 So don’t be ashamed of sharing your story; you never know who’s life you might end up changing.